The Temple of Heaven is an architecturally splendid set of religious buildings used for sacrificial ceremonies and prayers by the emperors of the Ming and Qing Dynasties. 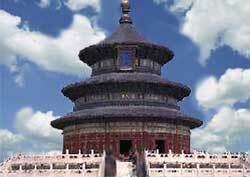 The most famous and beautiful of the Temple of Heaven buildings is the House of Prayer for Good Harvest (see photo). This masterpiece of Ming architecture is widely considered to be the finest of China's many outstanding temples. It is praised for its perfect proportions, its intricately painted ceiling, and its triple conical roofs adorned with glazed blue tiles symbolizing heaven. It is sometimes erroneously referred to as "The Temple of Heaven" but that term defines the entire temple-and-park complex. Tiantan (Chinese name for the Temple of Heaven) was built in the early 15th century and was later renovated and enhanced several times. In the mid-20th century it was designated a public park and the buildings were declared national monuments.